First, the curious finding. 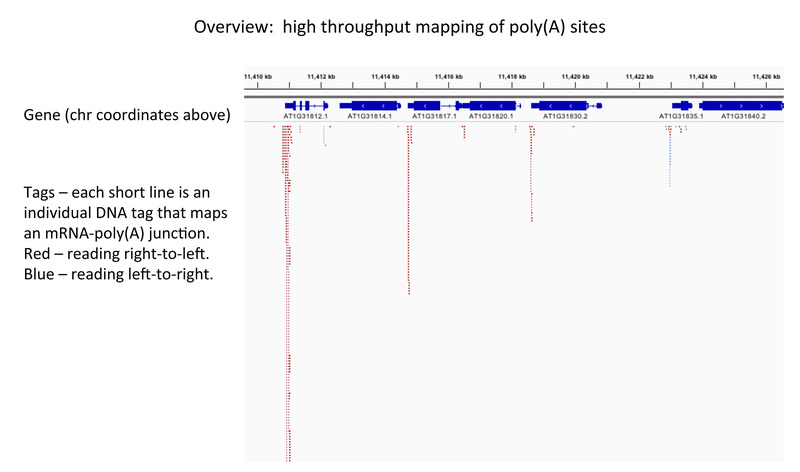 The main point of the paper was an accounting of all of the poly(A) sites “encoded” by the Arabidopsis genome (at least all of the sites seen in mRNAs present int he leaf and seed). As Fig. 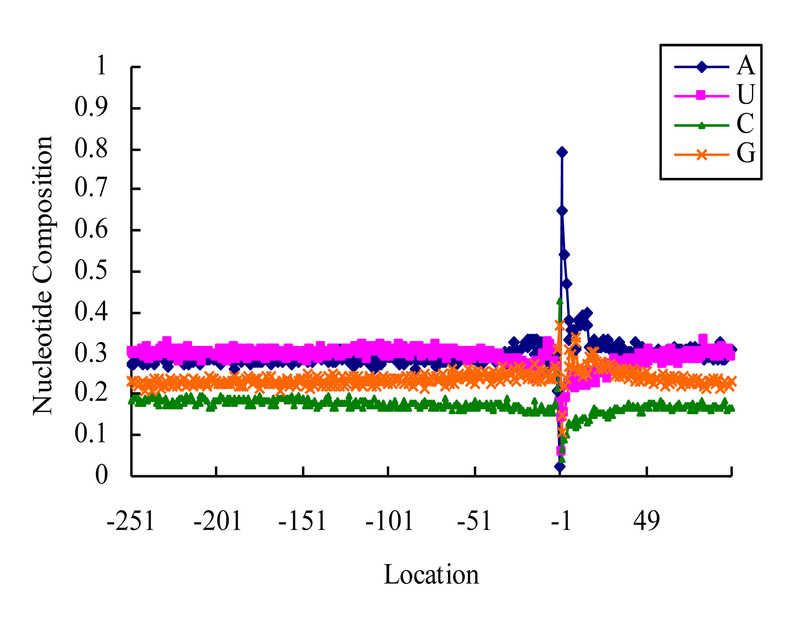 1 of the paper shows, a bit more than 10% of all “sense”* sites fell within annotated protein-coding regions. 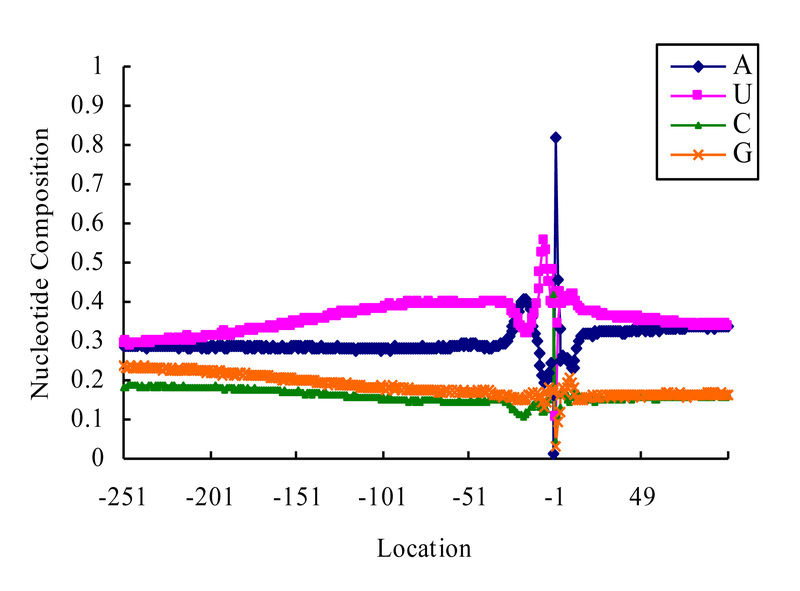 (The study by Shepard et al. reported a similar finding.) The existence of so many of these sites was quite unexpected. This is because processing and polyadenylation within a protein coding region will, except in rare cases, produce an RNA that lacks a translation termination codon. These so-called non-stop mRNAs are expected to be relatively unstable and polypeptides produced by translating such RNAs should be degraded; these activities are necessary to promote proper recycling of ribosomes, that otherwise would pile up along such mRNAs owing to the absence of translation termination codons. I haven’t got a good explanation for these sites, other than they exist (and they are not rare, judging from the numbers of tags that correspond to these sites). This goes to show, though, that there is probably much to be learned about non-stop mRNAs in plants, and about the interplay between mRNA surveillance and RNA processing. 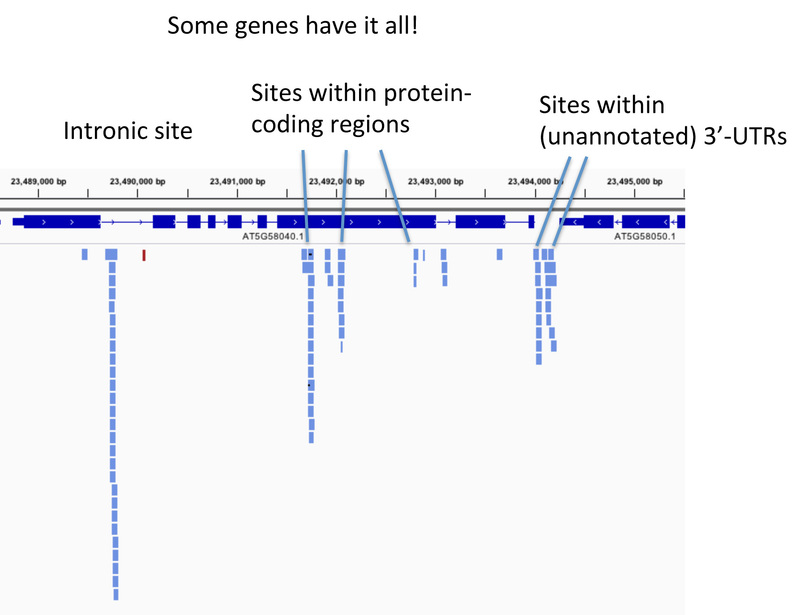 An overview, showing the distirubtion of tags superimposed on the genome annotation. A close-up showing the typical occurrence of multiple poly(A) sites. An example (rare) of a site that lies within an annotated 5'-UTR. Some genes have it all - sites in introns, CDS, and 3'-UTRs! In case anyone is interested, these illustrations were made using CLC Genomics Workbench (to map tags to the genome and make the .sam and .bam files), SAMtools (to do the indexing of the .bam files), and Integrated Genomics Viewer (to display the tags using the .bam files). I’m far from a computer geek, but even I can manage to use these tools with little frustration. Enjoy the paper, and, as I said above, feel free to ask questions in the comments. * – so-called “sense” sites are those sites that are oriented in the same direction as an annotated Arabidopsis gene or feature. This entry was posted on Saturday, July 23rd, 2011 at 7:58 pm and is filed under Polyadenylation, RNA Processing. You can follow any responses to this entry through the RSS 2.0 feed. You can leave a response, or trackback from your own site. 1. In the abstract to the paper “CDS protein-coding…” what does CDS stand for? 2. APA (especially antisense APA) reminds me of the “junk DNA” of 30 years ago. More and more levels of (and mechanisms for) gene regulation. Like the “cost” of carrying extra non-coding sequence one might consider APA an aditional biochemical cost if the transcripts generated have no biological value. Or is the value yet to be appreciated? 1. CDS stands for coding sequence. 2. I think that there is no one explanation for APA. There are several examples where APA contributes to gene function, and probably others where it is hard to see any “use”. I am not much inclined to worry about the cost of extra or unnecessary transcripts. In the bigger scheme of things, DNA and RNA metabolism doesn’t use much of the cell’s energy budget, which means that there is probably a negligible cost for making some (or even lots) of RNA that is not translated (or indeed, is thrown away).